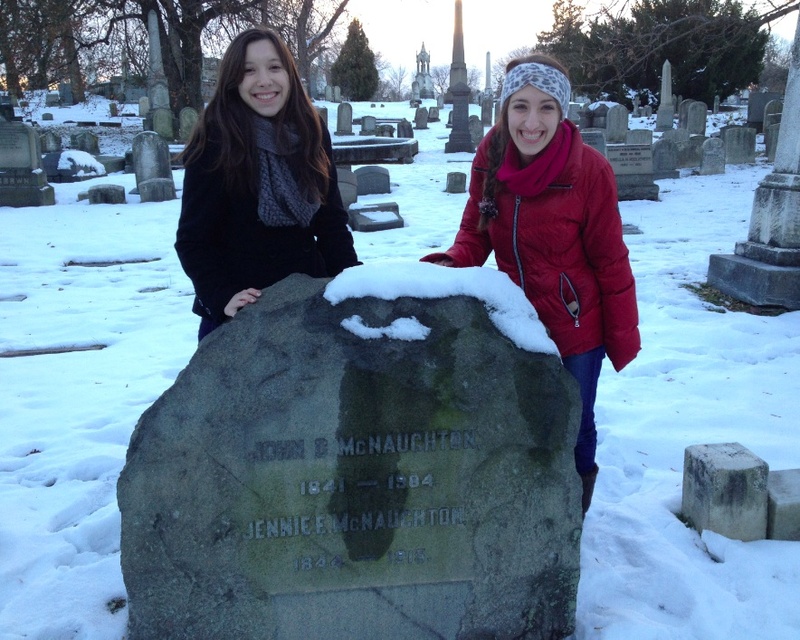 Each year, AP US History students from Mr. Steve Gilligan's class at the J.R. Masterman School complete the Cemetery History Project: an in-depth, group research project on an individual who has become a permament resident of The Woodlands. The students visit The Woodlands in the early fall, enjoy a Victorian Era picnic (often dressed in period garb for extra credit! ), and roam the grounds in search of a headstone that speaks to them, intrigues them, and humors them. The students' research subject must be born before 1850, cannot be famous, and must not have been researched for this project in years prior. After selecting an individual, their adventure begins, and they research laboriously to recreate the real life of the chosen deceased. Students were encouraged to submit their research and thoughts on this project to this blog. Because of their hard work and dedication over the course of the semester, we're a step closer to learning more about the individuals who make up this "garden of biographies." The Woodlands is happy to share the thoughts and research of Gregory Whitehorn, Angelica Borda, Micheala Drust, and Vasili Mantsos over the course of their Cemetery History Project on John Calvin McNaughton (1841-1904). Please note that any views, opinions, and research presented below are solely those of the authors and do not necessarily represent those of The Woodlands. Today we went to the Woodlands Cemetery to begin our long journey on this project. Before we took the subway and trolley there, a few high school seniors lectured us with tips and ideas for the project. Some of us traveled to the cemetery in Victorian Era clothes. I received a few weird looks from subway riders because of my top hat and bow tie (which I still think is incredibly stylish). After a brief explanation of the history of the cemetery given by a staff member of The Woodlands, we were sent off to find a person to research. Immediately, the first thing our group did was eat. Then we walked around all the way around the incredibly large cemetery looking for any interesting grave stone. We decided on a few names, (and by that I mean around 12), and wrote down three for the cemetery to do a little research on. I made a joke about McNaughton sounding like McNugget. By the end of the day our group felt good. We found a few names and all we can do is hope that they show up in some 19th century obituaries! The obituary begins with “Suddenly”, leading us to believe his death was unexpected and possibly tragic. “Crescent Lodge, No 493. F and A M.” are respectfully invited to his funeral, ergo he most likely belonged to this masonic group, something we definitely want to look into. His “late residence” (2034 Race St.) definitely made us want to stick with this man, especially because the address is so close to our school (J.R. Masterman). Once this obituary was found, I searched on the microfilms for his name and found it mentioned in a Philadelphia Inquirer article titled "Worker Strikes a Snag Newspaper Article" from December 21, 1890. I found that he ran into some trouble in court. I briefly read over the article, discovering that he was quite rich and owned a company as well. In the article he was put on trial, but the most interesting thing he states in the case was that he owned 18 houses! It was settled: J.C. McNaughton was our guy! We made sure to start our Cemetery Project right away, so on this cold and rainy day, I went with Vasili and Greg to the Pennsylvania Historical Society. We arrived with high morale, ready to uncover McNaughton’s life, yet were shocked when there was no record to be found on him! This spawned immediate fear and many, many questions. We knew from McNaughton’s obituary that he was a freemason, and thus part of this highly secret and mysterious society. We also knew that McNaughton was involved in many court cases from documents we had found the previous day at the Free Library. Then, to add to these two interesting facts, McNaughton’s obituary also stated that he “died suddenly.” With a thousand questions circling our minds about him, we were even more eager than before to dig up his life. Our Cemetery Project was off to an exciting start. Excitement was bubbling as a result of the Cemetery Project. After all, it was what all the former APUSH seniors were talking about. I decided to do some research on the Free Library Historical Newspaper database and I struck gold. I found Mrs. McNaughton’s obituary from the Philadelphia Inquirer in 1915. It stated that she was the wife of the late J. C. McNaughton and her name was the same that is on the gravestone at The Woodlands Cemetery. This was a confirmation that our research would take us somewhere. We found someone who was definitely worth our while. All of this made our group very excited because these were insights that someone presumably close to McNaughton had, especially because the compliments were so personal. Either way, the document was a huge score! Really starting to feel like we were getting to know McNaughton, we decided to search for more records tomorrow at the City Archives. After hours of research over the past couple of days, we decided to try to find McNaughton’s official death record at the City Archives. Michaela, Vasili and I learned to understand the research process there fairly quickly. There are huge books, handwritten, that contain almost everyone in the 19th century’s death dates, and microfilm numbers. We found McNaughton, but was surprised that his name was misspelled. His death record read “John Calvin McNaughlin”, but the archivist assured us that misspellings were quite common, due to the fact that everything was handwritten. The address, birth and death years all matched, so it is safe so assume that we’ve found our man. Confused by the medical language on the document, the archivist explained the major cause of his death, “Angina Pectoris”, was a big word for heart attack. This was a nice moment for us because we realized that connected well with the “suddenly” on his obituary! Oddly enough, when searching deeds for the 2034 Race St. residence, the deed to the house was under McNaughton’s wife’s name, Jennie E. McNaughton. This seemed very strange to us because it does not make sense for a woman to have those type of rights in the late 1800s, but when searching for the original newspaper article I had found at the Free Library, I realized McNaughton mentions in the court case buying their current home and giving it to his wife as a Christmas present! We then decided to find his marriage certificate to find out if the marriage was near the time of the purchase of the house, but once we found it we discovered it was not. We ended on a very good note, and found three very useful documents. Though finding the information was tedious and required much patience, this trip was a huge step forward and helped us find a lot more about John C. McNaughton. As the rest of the cemetery group went to the City Archives, I was coming back from a trip to Delaware Water Gap with Outward Bound. It was cold, but also fun and a break from the stressful school live we all live in. 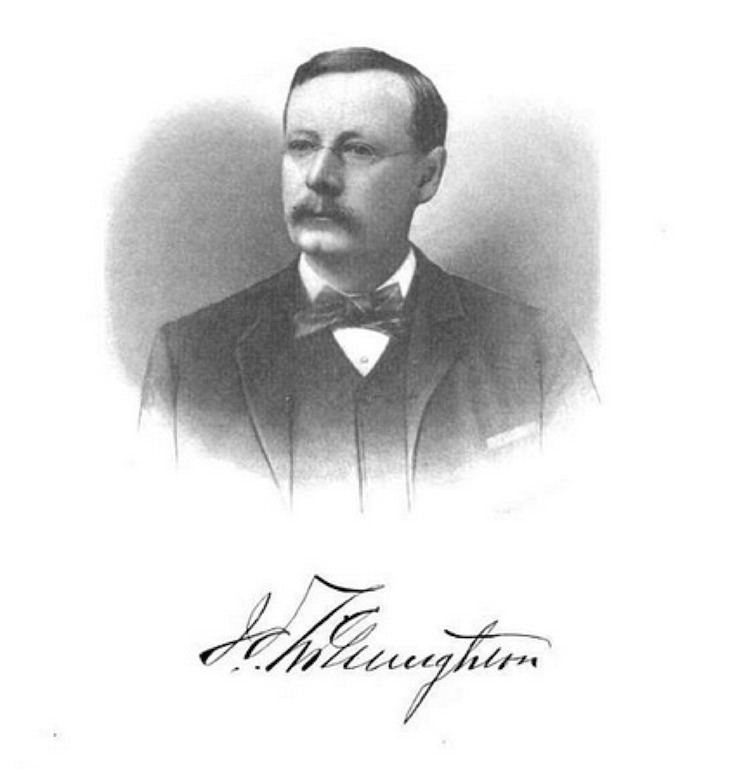 I decided to do some more research and found McNaughton’s name in a New York Lumber Magazine obituary page from 1904. This was an exciting find, as I began to discover McNaughton’s fame in the railroad industry. To add, while searching for his name on Ancestry.com, several city directories came up and I somehow found an add pertaining to McNaughton’s lumber company in a North Carolina business directory. Surely, researching was becoming more and more exciting! I came to realize throughout the night that Ang has an amazing house. Her microwave is unbelievably awesome and the couch in her living room is super comfy. Besides that, we went to work on the project, doing some more research and thinking about formatting for the biography, the most important part of the project. Aside from the late night and the fear of falling asleep on the couch, the night was productive and we were ready to get a good night’s sleep for the next day of work. At Greg’s house, we all signed into ancestry.com and got working. I found about 10 documents, many of which were useful, but one stuck out to me. One document was from 1850, when McNaughton was only ten years old, meaning it has his original family and details about where he grew up! This was really exciting for me because I was getting worried about finding details about his early life, because obvious there is not much documented on children at the time. The document is an 1850 census of Delaware, Juniata, Pennsylvania, matching the biography I found in the Prominent and Progressive Pennsylvanians book. After studying various forms of Christian name abbreviations of the time, I uncovered the names of McNaughton and his family (Jno stands for John, Jas for James, in case you were wondering). This document gives us the names of McNaughton's parents, Ellen and James, and James' occupancy as a farmer. It basically gives us a lot of really great insight that we would not have found otherwise! Today, with little other homework, working on the Cemetery Project seemed like a good idea. I decided to start analyzing the most confusing, longest, and most dreadful documents of all--the court cases. We had found a lot of court cases, but just kind of let them pile up since you need about seven lawyers to understand them. Court Case No. 1: John C. Turner v. Albert Postlethwaite (1876): John C. Turner, the captain of one of McNaughton’s vessels sued J. C. McNaughton and Co for thirty dollars. Court Case No. 2: J. C. McNaughton and Co. v. Charles and Peall: McNaughton went to court against Charles and Peall over a judgement debt. (In my research I found out that a judgement debt is the debt that has to be payed to the plaintiff by the defendent in the court case.) McNaughton won the case. Court Case No. 3: Bank of America: I was kind of surprised when I found out that McNaughton was a director of Bank of America. (I think about all the times that I’ve walked past or driven past a branch of the bank and never had any idea!) In 1890, a year after McNaughton was elected a director of the bank, the bank closed its doors. McNaughton testified in court on behalf of the bank, but he was denied by the court for “technical reasons”. It is still unclear exactly what this means. Court Case No. 6: J. C. McNaughton v. I. L. Haldeman: (My favorite court case.) I. L. Haldeman denied the validity of a promissory note (a handwritten note in which one person promises to pay a sum to another) because it was written during a horse race (essentially they were gambling). The court ruled that the note was valid and that Haldeman had to pay up. Through all of this I learned that I will never become a lawyer. Well, this seems like a good day to get some work done on this project. I’ve been pushing it off the past couple days. I keep saying I’m going to work on it and I never do. I haven’t completely been focused on it...but I’ll start today. I found a few documents relating to McNaughton's business and I analyzed them and some of the other ones on the documents page.This one really cool document talks about how he owned a bunch of steamboats that he used to ship materials in and out of Philadelphia. He even named a steamboat after himself! This is gonna be a long process, but in a way I’m looking forward to it. I did some more at home work today. We haven’t really been keeping up on analyzing our documents. If we keep this up they’re gonna be pushed back to the end and then it is going to be awful having to do it all at once. Plus some of the ones we already have aren’t too great, so I fixed a few up. These inferences are kind of difficult. Some of these documents literally just say that he lived at a certain place. The only thing you could really infer is that he had money, or perhaps he just liked to try new things. We’re making good progress but we have to start doing more. It’s still early, but when you think about it, there’s only a little more than a month left, and it is going to come quick. Plus we have all his other work to do. Its not going to get easier. Today, we went to City Hall. We were searching for one document in particular:the will of John C. McNaughton. On arrival, I worried about just walking right into City Hall. I thought we would need a visitors pass, but I guess that is just for where city officials like the Mayor work. Anyway, we walked into City Hall, went to room 185 and tried to find the will. We asked around and finally were sent to find his name in a giant book full of wills filed in the late 19th century of people whose last names started with “Mc.” At first, we worried that it was not there, however after some careful examination we found it. With help from the City Hall workers we were able to purchase a copy of both Mr. McNaughton’s will and Mrs. McNaughton’s will. It was a successful day! Michaela thought it was nice that they stayed open late on Thanksgiving Eve for us! With a quite full stomach (the day after Thanksgiving) I decided to be thankful for the cemetery project and work on it! I was getting really annoyed with the fact that our documents weren’t in chronological order and that you had to search for the document you wanted. I decided I was going to put the documents in chronological order. In all, it took me about four hours to just put them in order! Then on top of that, I added and edited a lot of the documents analyses. Once they were in chronological order, it was easier to find the document you were looking for, and also it was cool because when you scrolled through the list, you were scrolling through his life. Today I Skyped with Michaela and Greg who were at Greg’s house working together on the project. I had no way of getting to his house today, so this was the only other option. Angelica did not go either, but that’s because she was taking her test for her permit. So, to be completely honest, it was a kind of a waste of time. I mean we found some docs, but it wasn’t very organized, and we didn’t really know how to organize who did what work. The fact it was over Skype didn’t make the communication any easier. We joked around a little too much. Nevertheless, some work is better than no work. Today was good and disappointing at the same time. Our group decided to head back to City Hall because we knew there was still a lot left there that could be very useful for our project. Last time we were able to find the will for John C. McNaughton. Today we were looking for house deeds. It took about ten minutes until we finally went inside though, because we were trying to find out exactly what room we had to go to. We called a few places that weren’t very helpful, so we decided we would just find it eventually. We ended up walking around in a circle, or square, or whatever shape it is, until we finally found the right room. Anyways, we walked in and the first thing I see is a woman sleeping at a computer desk. Then to the right I see a larger opening to the room with a bunch of empty seats, maybe about 16 of them, and a “Take-A-Number” thing that you see at a supermarket. I confusingly took one, but the lady working called me over to help. We gave her the address of one of his houses, the one we thought they’d find easiest: 2034 Race Street. Then she told us to take a seat and wait, which we did for about 20 minutes. Angelica had to leave early because she was late for a “Sweet 16” play for school. Me and Michaela killed time by playing “True or False” on my phone, and Greg sat behind us, very focused on something he was reading on his phone. Finally we were called back over. Before we were given a chance to look at the papers they printed for us, the lady printed a receipt and said $8, which Greg then paid because he had change. That was the first and last time we went there, because they kind of took a while, and it was $8, which isn’t much for a one time thing, but John C. McNaughton owns like 5 houses, so that’s going to add up. At least we got something though. We decided to start outlining the biography. We had dozens of documents and it was time to start putting Mr. McNaughton’s life together. We had collected all types of records, from newspaper clippings, to tax documents, to city directories. We spent a few hours piecing his life together. Even though we had accumulated these documents, we were far from done with research. Today was probably the most productive day of the cemetery project yet. Worked started super early (10 am) and didn’t finish until super early (2:30 am). Of course we ate A LOT and took some breaks here and there to watch Vine compilations and football but whatever. Anyway, the day started out at Angelica’s house. We began working on both the National and Philadelphia perspectives, finishing the outline of the biography, and adding last minute touches to all the document analysis’. Later at Vasili’s house, we began working on the biography. The biography was already outlined, now it was just time to get it written. We also started both the Philadelphia and National Perspectives. By the end of our almost-all nighter, the biography was written and just needed to be edited, and the perspectives were in the works. I guess when you want to get stuff done you just can’t sleep. Today Vasili and I Skyped to work on the Philadelphia Perspective portion of the project. We spent a few minutes talking about basketball and the NBA and the best player in the league (Reggie Evans). After we realized we were wasting time, we got to work and went through and edited the Philadelphia Perspective. Although far from finished, this meeting helped us figure out how to and what we had to do to successfully complete it. We made a table that consisted of important events from his life, and then we researched important events that were going on in Philadelphia around the same time. We found some pretty cool things, like about a horse causing a train to derail in Philadelphia. That was one of the stranger facts we came across. What better day to go back to The Woodlands Cemetery than on this freezing cold day? For me and Ang, there is no better day! After a much needed ride from Ang’s father, we retraced our steps around the cemtery and finally found McNaughton’s grave. We were shocked when we found another small grave stone next to his that read Katherine C. McNaughton (1881-1882). Me and Ang were so shocked! Could it be that McNaughton had another daughter? After an unsuccessful search for McNaughton’s mother Ellen McNaughton, we traveled to Old City and Penn’s Landing to take pictures of places where McNaughton worked for our photo essay. This was really cool because we were in the same locations McNaughton would have been over a hundred years ago. It made me realize that teens like me walk around this city and don’t realize all the amazing people whose footsteps we are walking in. Later tonight, we found out that McNaughton indeed did have another daughter named Katherine. What was this, daughter number twenty? We realized that all of the children McNaughton named after him or those in his family died at a young age. Jennie McNaughton (named after her mom), John C. McNaughton Jr. (named after his dad), and Katherine C. McNaughton (named after McNaughton’s sister) all died at young ages. We thought this was very weird. Thus began our long and also weird night of the cemetery project. Okay, technically I’m not at Angelica’s right now, I’m at home, but I’m going to talk about the last 2 days. So we had a sleepover Friday night at Angelica’s. We worked basically until 3 A.M. on Friday night. We got so much done though. We finished the biography (for the most part), and did organize some documents. The food I must say was the best part. We ordered pizza, my favorite. So after we were done at 3 (at this point we are in the basement), we start to have some fun. Me and Ang are tossing a volleyball around, Michaela was doing something on the ground, and Greg was saying delirious things with his headphones on like he always does past 12. Anyway, he got hit in the face twice (kinda my fault), and after that it was 4, and we decided we should go to bed. So the girls went upstairs, and Greg and I stayed in the basement. We laughed hysterically for about 10 minutes after about stories from our past, like baseball and basketball games. (Lack of sleep might have added to the funny-factor of these stories). The next morning, which is technically this morning, we got up at 10, and Mr. Borda (Angelica’s Dad) made us pancakes. After this we got right to work for a few more hours, and then at about 2 P.M. decided we wanted to go get junk food. So we walked to CVS and got ice cream and root beer, which we then used to make floats, and some cookies and pop tarts. After a small snowball fight on the walk back, which I won, we worked for another 2 hours or so until the food was ready. Then we ate and Mr. Borda drove us all back to our houses at like 6 o'clock. It was raining, and cold. I just got home not too long ago. We got so much done though-biography, Philadelphia perspective, most of the national perspective, and we got a decent start on the timeline. We are really gonna try for early bird. WE CAN DO IT! All that is left is organizing the documents, adding finishing touches to our papers, the historical fiction and then setting up the binder. It’ll be very interesting setting up that binder. It’ll feel amazing in a way--we’ll be able to see where we first started and how far we’ve come. John C. McNaughton’s life really was fascinating. Today we had a meeting on Skype. While chatting with my fellow group members I came across a document online pertaining to McNaughton’s business in New Jersey. This document stated that McNaughton’s charter for his business would become null and void because his company did not pay taxes in New Jersey. It has happened a few times in the past when a document enforces another previously discovered document or clarifies what has already been found. In this case, this document reinforced our confidence in the inferences we were making based on the documents we already had. It's 12:11 am, and I’m still working on this project. I’m about to go to bed, but I figured I get in an entry for today. As I look back at the previous ones I’ve written, its funny how much things have changed since the first one. Its been about a month since I first started and I must say even though I’m tired I am enjoying this project. Now this weekend is gonna be awful because we have to try to put this together by Monday for early bird. Now if its not good enough, obviously we won’t turn it in. But if we work all 3 days together, and stay consistent for tomorrow (Wednesday) and Thursday with our work, we have a good chance to get it done. Hopefully it works out. Vasili came over at 10 am on this beautiful, winter day. Once we got coffee into our systems, I decided it was time to finish the timeline and get it to staples. The timeline now shows parallels between his life, the nation’s, and Philadelphia’s. The timeline was very tedious and took a lot longer than I had planned it to. Between today and yesterday, the tension has mounted far beyond where we would like. Early bird is just within our reach, and I’m positive we can finish, but others are not as sure. Greg has joined us, and the three of us have been working consistently since the morning, with no breaks besides for meals. With lack of sleep, we bicker about unnecessary things like where to put certain documents and what type of coloring book we should make. The extra creative extras Mr. Gilligan has assigned us that The Woodlands has requested are more difficult than I’d hoped. We have chosen to do both this blog, and create a coloring book of McNaughton’s life. Though the coloring book seems simple, due to the lack of artists in our group it has become a huge problem. With all the writing done, this weekend is the final stretch. Less than forty eight hours left, and we have yet to pull each other’s hairs out. We are all sleeping over Greg’s tonight, and we’re ready to work hard for as long as necessary. The research, the papers, and the timeline are all done. Hopefully by tomorrow, the only thing left is to assemble the binder! If not, early bird will be impossible. Enjoy a picture of a gingerbread model of his house at 2034 Race Street that we made. Today was the most stressful day for me, so far, of this project; with Early Bird two days away, I had to perform The Nutcracker all day. I took my computer with me to rehearsal and while I put on my makeup and hairsprayed my hair, and in between shows, I worked on the cemetery project. After performing three shows (the last one finished at 8:30 pm), I went home, showered real quick, and came to Greg’s where we worked until 3:00 am. We worked on citations for the documents and edited all of our papers. We did a lot of other small things, such as outlining the coloring book. The stress is really piling up with Early Bird a day away. Assembling our binder! Early bird is less than 12 hours away. We are looking hopeful to both be finished with the project and stop seeing each other. I’ve seen the majority of this group for around 56 hours straight. We’ve double and triple (thanks to Greg) checked our research, all of our documents are in order and the last thing we’re doing is the online binder assembly for The Woodlands, and writing our personal reflections. This has been a long, tiresome project and I’m sure we’re all glad this is coming to an end.